A derby victory is always sweet and for Preston to beat Bolton during a good patch of form made it all the more pleasing. The win at the University of Bolton Stadium was PNE’s third on their travels on the bounce, to following last month’s victories at Stoke and Queens Park Rangers. So if they could give their home form a bit of a nudge over the next week, that would see them flying. If a challenge for the play-offs is to prove beyond reach, then at least a strong finish to the season would bode well for next time. I like that Alex Neil has challenged the team to climb the table and have the play-offs in mind. Players need a goal to aim for and you don’t want the season to just fizzle out. As I mentioned, the top six might be a tall order but never say never. It was good to see Alan Browne on target with the opening goal at Bolton. He’s on 11 for the season, all in the Championship, and that is a great return for a midfielder. If a striker had scored 11 goals by early February, he would be talked about in glowing terms. So for a midfielder to do that, on top of nine he got last season, is impressive. Tom Barkhuizen came back into the team to score the second goal. He’d had a few games on the bench for a breather and so will have been pleased to find the net. North End do tend to spread the goals around their team pretty well. They haven’t got a 25-goal a season striker – mind you, who has at this level? – so they source goals from different areas. 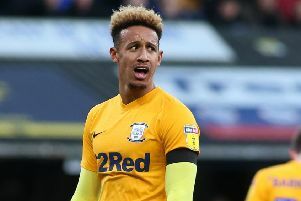 Callum Robinson had got to the 10-goal mark before his injury, playing either from the wing or up front. Browne has just gone ahead of him, then you’ve got Barkhuizen, Paul Gallagher, Daniel Johnson and Louis Moult who have all chipped in with their fair share. If the opposition do a job on your main scorer, it’s good to be able to turn to others in the team to keep the goals coming. It’s now back to Deepdale for North End as they play Norwich and Nottingham Forest back-to-back. Norwich arrive top of the league, fresh from their win over Ipswich Town in the East Anglia derby. They are Neil’s former club don’t forget, so that will add a little bit of spice to the game I would think. Neil should get a very good reception from the Norwich fans who make the trip. For him to got them into the Premier League in his first five months in the job, in his first managerial post in England, was great going. Norwich are looking good for a tilt at promotion this time and are lasting the course well – it was only the other week that they beat Leeds at Elland Road. Next Saturday, it is Forest who visit Deepdale. O’Neill and Keane will know about Preston’s Irish players and it makes for an interesting game.